Geneva motor show 2012: VW Cross Coupe | What Car? The second Volkswagen Cross Coupe concept car makes its debut at the Geneva motor show on March 6. VW revealed the first Cross Coupe at the 2011 Tokyo motor show; the Geneva show car has a new paintjob and a different hybrid powertrain. The Cross Coupe is a design study based on the next-generation A3 and Golf hatchback platform that shows how a future sporty SUV could look. In addition to new red paintwork, the Cross Coupe at the Geneva show has a new diesel plug-in hybrid powertrain, with two electric motors and a diesel engine. VW quotes an average of 157mpg and CO2 emissions of 46/g/km. VW quotes an average of 157mpg and CO2 emissions of 46/g/km, which is impressive enough in itself. However, the Cross Coupe can cover up to 28 miles on electric power alone at speeds of up to 75mph, which means the majority of commutes can be tackled with zero tailpipe emissions. In pure electric mode the diesel engine is decoupled from the drivetrain, but it re-engages in a fraction of a second if the batteries run out of juice. Maximum power output is 302bhp and top speed is 137mph. 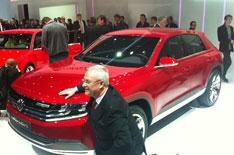 At the Tokyo show, VW research and development boss Ulrich Hackenberg gave strong hints to What Car? that the Cross Coupe is likely to be built and that a three-door version will be available. If the Cross Coupe does reach production it would be a rival for cars such as the BMW X1 and Range Rover Evoque.